OKI pro920WT Super Bundle, the white toner t-shirt transfer bundle, is available now until August 31st. Virtually pay off your 920 system with the purchase of this bundle! The world's first professional white transfer solution includes one FREE SET of toner which can produce up to 4,500 t-shirts or 9,00 mugs. 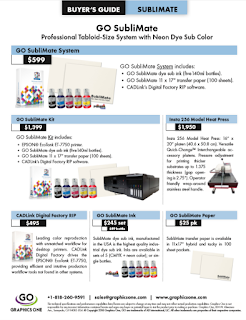 * The OKI proColor 920 WT is revolutionary white toner transfer bundle for dark shirts and hard surfaces including the OKI pro920WT, 1620 HD Heat Press, GO uPress One Mug Heat Press, one pack of 8.5" x 11" FlipIt 1.0 Dark transfer paper, one pack of FlipIt 2.0 Dark transfer paper, one pack of 8.5”x11” FlipIt 1.0 Hard Surface transfer paper, and one Logo It. Free Set of Toner with Purchase of Bundle--A $914 Value! The OKI 920 WT features a revolutionary high definition white toner with vibrant, outstanding color images for transferring onto white and dark t-shirts of various fabric types. Applications include production of t-shirt graphics, garment decorations and hard surface applications such as mugs, ceramics, wood and more. *Includes starter toner set along with full set. Measurements based on 8.5x11 T-Shirt or a coffee mug with 20% CMY and 10% W density with full coverage. Results may vary.